Nutri-Defense works by binding up excess nutrients, feeding Pond-Clear bacteria and polishing pond water. After Nutri-Defense has bound up the excess nutrients, the nutrients sink to the bottom, out of the water column. It is at this stage that Pond-Clear or VitaStem MD Pellets are able to further break the nutrients down, reducing the chance of future growth. Nutri-Defense allows you to "manage the nutrients" so you can manage water clarity. Works best when used with the 1st and 3rd Pond-Clear application early in the season before or after a chemical weed application. Safe for People, pets, fish, livestock & wildlife. 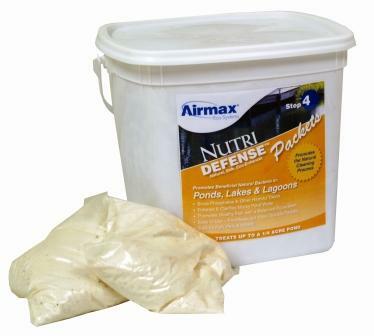 570101 Nutri-Defense works by binding up excess nutrients, feeding Pond-Clear bacteria and polishing pond water.